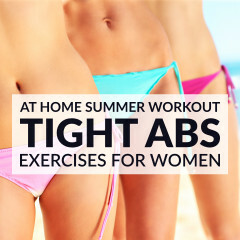 The secret to a slim waist lies in a combination of exercises that work your abs, obliques, and the transverse abdominals. These 10 waist slimming moves are perfect for toning and defining your waist and abs, and banish those love handles for good! Start this waist slimming workout with a core warm up routine. 2. Side crunch leg raise: 45 seconds. Lie on your back, raise your left leg and your upper back off the floor, reach your arms to the left side and crunch. Switch sides and repeat. 3. Alternate heel touchers: 45 seconds. While on your back, bend your knees and keep your arms extended and by your sides. Crunch forward and to the left, touching your left heel with your left hand and hold. Return slowly to the starting position and repeat the movement on the right side. 4. Wood chop: 30 seconds + 30 seconds. Stand up and hold a dumbbell with both hands. Rotate your torso to the right and raise the dumbbell until it’s over your right shoulder. Squat as you rotate your torso to the left, and bring the dumbbell diagonally across the body until it’s close to your left hip. Repeat for 30 seconds and then switch sides. 6. Star toe touch sit ups: 45 seconds. Lie on your back, raise your right leg and your torso simultaneously and reach your left hand toward your right foot. Return to the mat, and repeat on the opposite side. 7. Bird dogs: 60 seconds. Start on your hands and knees with the hands under the shoulders and the knees under the hips. Extend one leg and the opposite arm at the same time and pause. Switch sides and repeat. 8. Reverse crunches: 60 seconds. Lie on your back, lift your knees until your thighs and calves form a 90-degree angle and your calves are parallel to the floor. Lift your hips and bring your knees toward the chest. 9. Toe touch: 60 seconds. While on your back, hold a dumbbell with both hands and lift your legs until they’re perpendicular to the floor. Extend your arms, lift your shoulders off the floor and try touching your feet with the dumbbell. 10. Side plank hip lifts: 30 seconds + 30 seconds. Start in a side plank position, with your shoulder over your elbow and your body in a straight line. Bring your hip down, without letting it touch the floor, and then bring it back up to the initial position. Repeat for 30 seconds and then switch sides. Finish this set of waist slimming exercises with a sequence of static stretches. 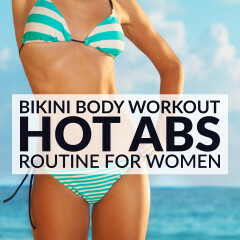 Tone your abs & banish love handles for good with these 10 waist slimming moves!